Chamber members can now save on office supplies through IBS!! We are pleased to announce that we have added ANOTHER member benefit!! Independence Business Supply has designed an exclusive program for NOACC Members for the purchasing of office supplies, ad specialties, furniture, janitorial and sanitary supplies, and full-service printing. The Chamber Office Plus program addresses the specific needs of Chambers of Commerce and significantly reduces their members’ expenses and simplifies the ordering process. Click here for more information!! 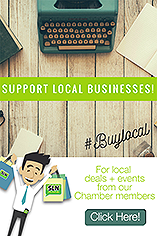 Be sure to give our Chamber code 2400, when placing an order.